People ask me all the time if they can have my job. NO! Mine. 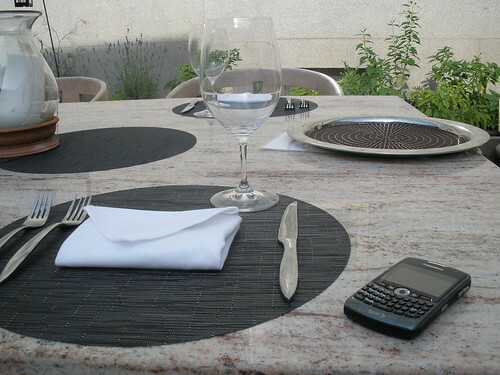 Well, you can have my day job, but you’d have to fight me to the death for my foodie blogging job. And it would be your death, not mine. Along the way, through press dinners, media previews, nights out with friends, and places I’m reviewing for our We Love Food feature, I run into some damn good dishes (for up-to-the minute reviews, follow me on Twitter). Forkful after forkful, I wind up eating some dishes that make me think back with ultimate fondness, and leave me longing for them. Last month I told you all about with them in a little piece I called Eat Like Me. It was so popular with you guys, and I enjoyed writing it so much, that I decided I’ll do it every month. 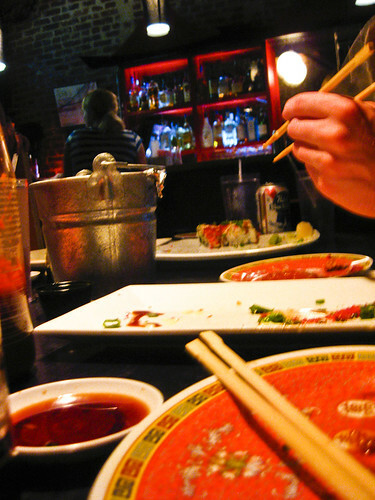 Sort of like a what’s worth it of my food intake – a satoralist of food, if you will. So. June. It was rainy, right? Ugh. But it was also chock full of food for me, my calendar was overwhelming. June is a busy month in the foodie world. New warm weather menus come hot off the presses, restaurants open their doors to hungry summer crowds, and my friends want to eat out more. It’s pretty glorious. So, click on through to see what made the cut. Wine: Viña Leiriña 2007, a blend of Treixadura, Albarino & Godello from Ribeiro at Jaleo. Wine doesn’t tend to make the cut on these lists, but I adored this special wine Jose Andres was serving at the Paella festival earlier this month. Sweet, but not sugary, it was the perfect light pairing for seafood dishes. In fact, I’d go sit at the bar at Jaleo just to sip on this. 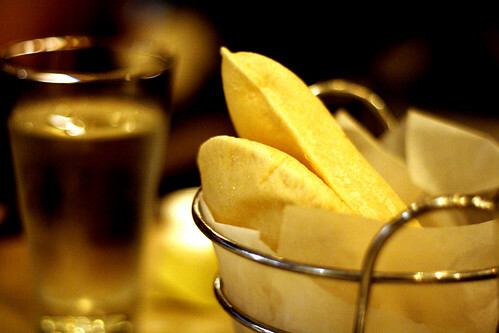 Bread: Pita at Zaytinya. Here’s the thing about Zaytinya – I’ve known about it since I was a newbie to the city, fumbling my way around. My wise roommate and her foodie dad had sniffed it out well before I even knew how to pronounce it. So I hate to admit it, but I forget about Zaytinya. Not always, because last year I had my birthday dinner there, but I forget exactly HOW good it is. Chef Isabella can whip up some awesome food, but the bread here is my all time favorite. My friend Beth laughs because it comes out all poufy and hot, and you have to stab it with a fork and get blasted with hot air. She says it’s like killing bread. The best thing about Zaytinya’s bread, other than the fact that they keep it coming, is the wonderful oil and sweet vinegar that comes with it. Perfection, truly. Best bread basket I had in June, no competition. Cocktail: Honey Kiss at Domaso. There’s something perfect to me about fresh fruit in a cocktail. I know this is a simple, unoriginal concept, but I don’t care. I like it, and that’s what this is all about right? Tucked away between two skyscrapers in Rosslyn, Domaso’s patio is this hidden oasis. With a killer view of the Potomac, Key Bridge and Georgetown, sipping the Honey Kiss, I was one happy girl. 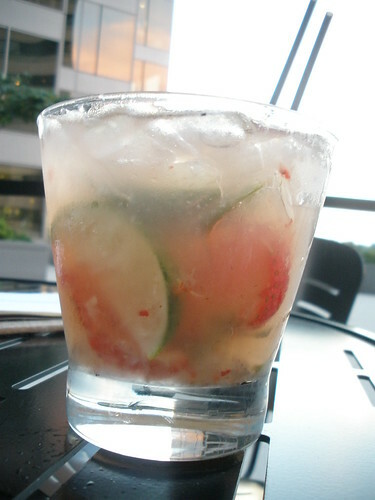 Chock full of limes, crushed whole strawberries, Leblon Cachaca and a bit of honey it was refreshing. Ideal for a June evening. Soup: Cheddar and Ale at Commonwealth Gastropub. Oh dear lord. I love cheese. Let’s revise that statement. I LOVE cheese. So if you melt it, put it in a soup, and mix it with beer, and then add some crispy croutons on top, you have yourself a recipe for total Katie heaven. Commonwealth serves it up in a mug, and I scraped the bowl but ultimately resisted licking it. Barely. 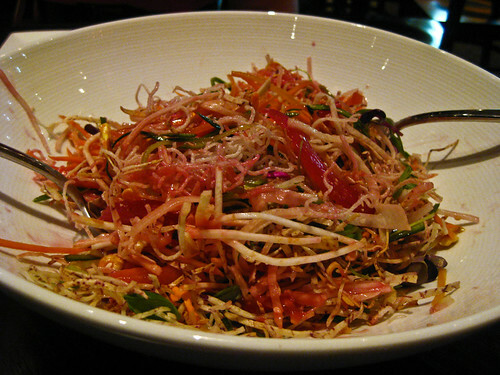 Salad: Singapore Slaw at Zentan. Aah, I already waxed poetic about this dish, but I’ll do it again, gladly. Sometimes, with all my eating out, I get a bit vegetable starved. Luckily, I tend to eat food from Chefs who appreciate seasonal veggies, but sometimes I just want a whole stack of them. A veggie-palooza if you will. The Singapore Slaw sounds awful from the name, but it is WONDERFUL. A light dressing over a crispy, fresh mix of 19 vegetables, all with unique textures sprinkled with hazelnuts, the slaw is the perfect break from heavy or fried food. Appetizer: Sweet Potato Fritters at Blue Ridge. It was almost a tie between this and the Hushpuppy from Eatonville that I discuss here, but seriously, ya’ll. Those fritters. TO DIE FOR. About the size of a golf ball, six come on a plate. Crispy on the outside, soft and warm sweet potato on the inside, with a smooth texture. Drag them through the mustard sauce it is served with, and it becomes the things food dreams are made of. Main: Sticky Balls and Godzirra Roll at Sticky Rice. Now I hesitate to put Sticky Rice on my list, because the service is HORRENDOUS. It’s insulting to my foodie sensibilities. But I get torn. Ya’ll, look, that Godzirra Roll is good. Crunchy shrimp! Tobiko! Avocado! Tempura crunchies! Zomg. I never endorse bad service, and I don’t care if bad service is just part of Sticky Rice’s dont-give-a-crap hipster image, bad service is never acceptable. But the sticky balls, they are heavenly. Crab, with tuna, rice, deep fried, with eel sauce. But the service! But the food! Service! Food! AAAAH! The food is good. That is all I have to say. I’m going to look back on those two items until I have them again, and that is the qualifier for an Eat Like Me dish, and so it is with deep reservations that I begrudgingly declare them my favorite main of the month. Maybe takeout is my answer. I bet even that they do slowly with an oh-you’re-still-here? attitude, though. Sigh. Side: Not-yet-on-menu Polenta with ‘shrooms at Sonoma. I’m not a big fan of mushrooms, but um, totally ate my words when Chef Nic Sharpe sent out this amish roasted polenta, fortified with goat cheese, and topped with a porcini ragu (madera, pancetta, porcinis) with a lemon balm and a seared porcini cap on top with ricotta solatta. OH MAI GAWD. It’s not yet on the menu, but Sharpe said he’s considering it as an appetizer or side. Brilliant. When/if it does become available, this is certainly a dish to order. Creamy, perfect polenta topped with tender ‘shrooms just made for a delicious, crave-worthy dish. 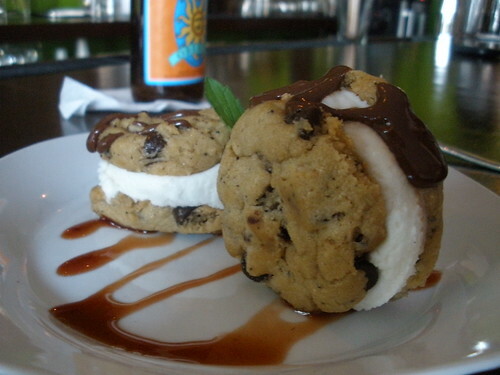 Dessert: Cookie Ice Cream Sandwich at Vegetate. I momentarily battled between this and the Root Beer Float from Blue Ridge, but the cookie and ice cream won hands down. Vegetate dishes up a fresh, soft just-baked cookie with vanilla bean ice cream between. About the size of a tennis ball, these little sandwiches are the perfect size to have a bit of dessert but not go overboard. Drizzled in hot fudge, I ate it with a spoon. The ice cream smooshed out of the middle and the chocolate sauce was a great addition. And with that, you have my dream meal made out of dishes I ate in June. Excuse me, though, as I must now go to the gym for 230483084203938409 hours. So what about you, what were your favorite dishes of June? Anything you can’t stop craving? My favorite June dish was Rabbit Rillette at Bistro Lepic. Oooooo drooool. I know it was almost all fat, but I don’t care. Ridiculously rich, melt in your mouth, dream til dawn. A close second – Sicilian Almond gelato at Pitango. Almost passed out on the first taste. oh dear. that ice cream cookie sandwich might turn me onto desserts. Love this! Thanks for the tip about the sticky balls and godzirra rice at Sticky Rice. I’ve been there a couple times and HATED it (both the food and service). I got noodle dishes both times. Won’t ever do that again. The fried ricotta balls at Taylor Gourmet are omg so so good.